The California Department of Education and the California Professional Nutrition Education Training Center at San Jose State University would like to thank the members of our Advisory Board for their time and efforts in creating this Outreach Toolkit. We gratefully acknowledge the work of the agencies, states and organizations that created many of the resources contained herein. We thank State Superintendent of Public Instruction Tom Torlakson in promoting a healthy school environment. 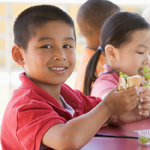 Mr. Torlakson considers health and nutrition a priority in California schools. We also gratefully acknowledge the contributions Sandip Kaur, Director of the California Department of Education's Nutrition Services Division (NSD) as well as contributions and support given by many NSD staff. Many thanks for the technical support and expertise given to this project by Dr. David Stone and Nutrition Major Hector Diaz both of San Jose State University.